Meth is short for methamphetamine. Meth is a highly addictive stimulant, illicit, street drug that creates an altered sense of happiness, well-being, confidence, and seemingly limitless energy for 6-8 hours, up to 24 hours for some users of meth. To the body, meth is a poison that first acts as a stimulant before it begins to systematically destroy the body causing psychosis, aggression, memory loss, brain, heart, and extensive damage to teeth most commonly referred to as “meth mouth”. Meth is highly addictive. There is less than a 1% chance that a first time meth user will not be addicted for life. Meth is commonly used as a “club drug”. Too often, meth is taken or unknowingly added to a person’s alcoholic beverage while partying at a night club or at rave parties. Meth recovery is about 5% and the life expectancy of an addict without treatment 7 years (Substance Abuse and Mental Health Services Administration). While national trends have shown meth use declining, this is not true for Minnesota. Carol Falkowski of Drug Abuse Dialogues, reported that 13% of drug treatment admissions in 2015 were meth related. Ranking higher were admissions for alcohol, heroin, and marijuana (Source: Mpls/St. Paul Drug Abuse Trends, April 2016) addiction. The oral signs and symptoms of meth abuse are significant and severe that the resulting condition is known as “meth mouth”. The journal of the American Dental Association published the results of a December 2015 study, Dental Disease Patterns in Methamphetamine Users, funded by the National Institute on Drug Abuse. Researchers examined the dental health of 571 meth users. Highlights of the study are listed below. and physiological changes that often result in a dry mouth. Rampant tooth decay on nearly every tooth along the gumline. Decay is often stained brown or black. Teeth appear unusually shortened from excessive clenching and/or grinding. The grim reality is that most meth users have extensive tooth decay on nearly every tooth and many teeth are so loose that the only option to alleviate mouth pain and restore their smile is full mouth extractions and replace missing teeth with full upper and lower dentures. Important to note: A meth addict typically avoids routine dental care. It often isn’t until they have been incarcerated or are in a meth rehabilitation counseling program. Dentistry for the Entire Family has successfully helped several people restore their smile following or in conjunction with drug addiction treatment. We will never scold, lecture, or judge. We are here to help you. Refrain from using nitrous oxide, sedation and/or narcotic agents. Your dentist will consult with your primary physician regarding use of over the counter pain relievers. Will likely require additional amount of local anesthetic due to permanent damage from use of meth amphetamines. Your dentist will coordinate proposed dental treatment with primary physician and/or rehabilitation providers. If you or someone you love are struggling with meth addiction, don’t hesitate to call the Substance Abuse and Mental Health Services Helpline at 1-800-662-HELP (4357) or click here to find a substance abuse and/or mental health treatment facility near you. Why meth? What is the allure to use meth? If you come in contact or are approached by someone you suspect may be under the influence of meth or ‘tweaking’, please consider the following precautionary, personal safety tips. If at anytime you feel as though you are in immediate danger, call 911! Maintain a safe distance to avoid being perceived as a threat. Avoid turning on bright lights, especially in low light areas. Bright lights exacerbate aggressive behavior. Keep hands visible to help being perceived as a threat. If you know the person, engage in conversation to help minimize the onset of paranoid thoughts and delusions. The initial response following smoking or injecting methamphetamine. A meth rush can last up to 30 minutes. The altered, euphoric state of period following the rush. They feel empowered, confident, and are delusional or intensely focused on a insignificant task or item. A meth high can last between 4-16 hours. Dubbed the “uncontrolled use of meth” in order to try and maintain high. Mental and physical hyperactivity is visible during this 3-15 days period as they binge on meth in an attempt to maintain the high. Dubbed the most dangerous phase of meth addiction. It is at this stage the meth user is unable to maintain the high and often becomes psychotic and hallucinates. This is the stage that they believe ‘bugs are crawling under their skin’ and often mutilate themselves in an attempt to rid of the bugs. Their psychosis and hallucinations keep them awake for days at a time. Just as the name implies, they crash hard, often sleeping for 1-3 days for they are physically and mentally exhausted and unable to cope as their body ‘shuts down’. A meth hangover lasts anywhere from 2-14 days. They are exhausted, often dehydrated, and starving. They will seek out food and seek a ‘solution’ to help. The only solution to their feelings is to seek out ‘more meth’. Often 30-90 days can pass after having used meth before the user realizes that he is in withdrawal. The meth user seeks out meth to counteract the feelings of depression and often becomes suicidal in the absence of professional intervention. 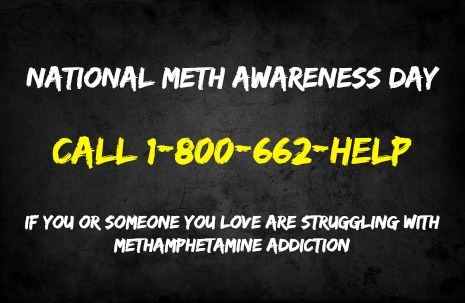 If you or someone you love are struggling with meth addiction, call the Substance Abuse and Mental Health Services Helpline at 1-800-662-HELP (4357) or click here to find a substance abuse and/or mental health treatment facility near you.